This one comes straight from Autumn Calabrese herself! 2.Combine almond flour, salt and baking soda. 3.In a medium bowl, whisk together the coconut oil and eggs then stir into the dry ingredients. 4.Stir in the bananas and fold in the blueberries. 5.Spoon the batter into muffin cups (makes about 8) and bake for about 25-35 minutes. 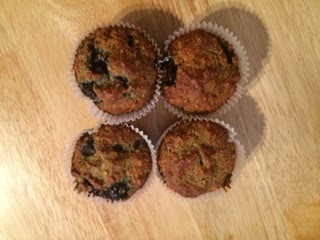 1 Muffin is 1 Purple and 1 Blue! container equivalency , 1 muffin equals what container and how many? Hi Sonia, thanks for asking the question! 1 muffin equals 1 blue and 1 purple! ENJOY! can I make this without banana? You can substitute applesauce instead of the banana or pumpkin in order to keep it moist!